A standard Tuff Tipper trailer doesn’t suit your needs? Not to worry. Tuff Tipper can customize our basic design in almost any way imaginable. 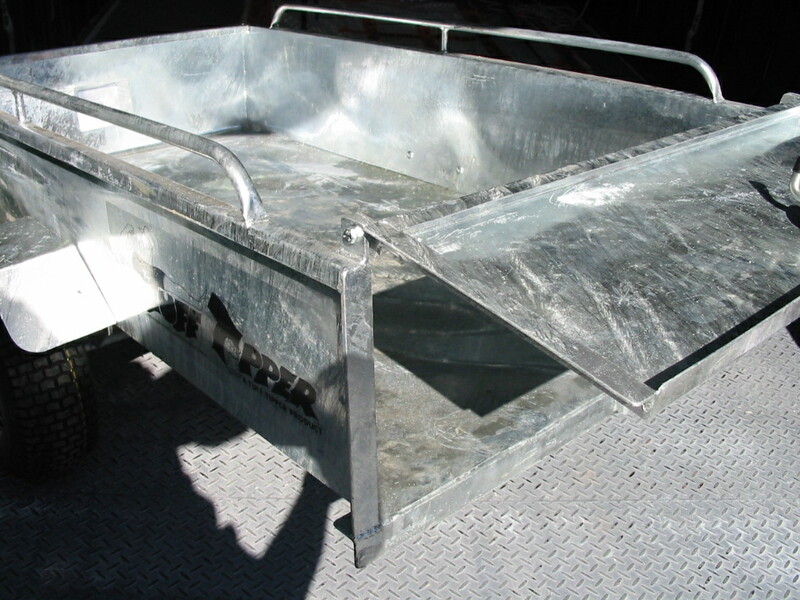 Talk to us today about your custom Tuff Tipper trailer requirements. Some of the most common customisations requested are to powder coat the trailer to match the colour of a ride-on mower or ATV. Often customers want a 50mm towball coupling fitted which we can do easily. 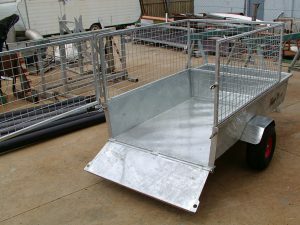 Tool racks, tool holders, mounting points, equipment mounts, strap loops, signage mounts, tail lights, drain holes, covers, cages, and suspensions are examples of trailer customisations we have done for our clients before. The following are some pictures of example custom Tuff Tipper trailers. This customer (above) needed a tipping trailer with a rear tailgate for harvesting macadamia nuts. Round items like macadamia nuts can roll out of a conventional tipping tray when ascending a slope. A customized Tuff Tipper macadamia nut harvesting trailer solves that problem. This customer wanted a cage surround and drop-down tail gate for carting small animals. In this case the cage was made for only 3/4 of the length to allow storage of other item in front of the cage.